Grade six students conducted comparative analysis through an innovative lung capacity test before and after Diwali to monitor deteriorating air quality in Delhi NCR. 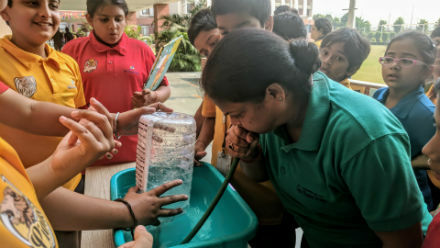 Noida: At a time when the air quality index (AQI) in Delhi NCR is at its worst, at around 450 on a scale of 500, grade six and nine students of Shiv Nadar School Noida (a not-for-profit initiative of the Shiv Nadar Foundation in K12 education) have initiated a drive to scientifically address the specific issue of air pollution. They have worked on developing an innovative air quality monitoring mechanism and have conducted lung capacity test to demonstrate the respiratory deterioration caused by pollution. They have also created a cost-effective prototype of air filter model and air humidifiers. This air filter model is equipped to remove solid pollutants like emission from products like paints, burning fuel, construction rubble as well as allergens like pollens and molds. “At Shiv Nadar School, it is our constant endeavour to inculcate innovation and problem solving skills in students, thus leading to the development of a sound scientific temper. We challenge students to develop workable solutions for problems in their immediate environment making use of technology and deep understanding of scientific concepts. 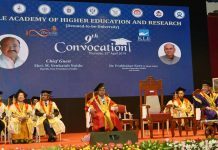 This is an initiative in the same direction, and I am happy to see the learning students have derived from it,” said Col. Gopal Karunakaran, CEO, Shiv Nadar School. The students created a scientific model to test the vital capacity of lungs of people of different age groups, before and after Diwali. Vital capacity (VC) is the maximum amount of air a person can expel from the lungs after maximum inhalation. A person’s vital capacity can be measured by a wet or regular spirometer or a model created on the same principles. The spirometer model was created using a water can (filled with 5 litre water), a rubber tube and a large container to hold the water and can. The can was inverted on the container with a rubber tube inserted inside. The can was callliberated on a scale of 5 litre and marked with the equal divisions of 250 mL. People of different age groups and gender were asked to blow inside the rubber tube in one go (up to their maximum capacity). Blowing the air inside the tube allowed water to displace out of the can. The students measured the individual lung capacity by comparing it with the amount of water displaced from the can. They calculated the lung capacity by multiplying number of divisions up to which water got displaced with 250 mL to find the lung capacity of each person. The lung capacity decreases with age and respiratory disorders (as shared by some people about their medical history). People who smoke or are more exposed to air pollution on daily basis showed poor lung capacity. There was an overall decrease in the lung capacity of people post Diwali indicating severe effect on lungs due to increasing level of smog and pollution. Above data shows every pollutant – Ozone O3, Pariculate matter 2.5 and 10, Carbon Monoxide CO, Sulphur Dioxide SO2 and Nitrogen Dioxide NO2 and the Air Quality Index (AQI) increased with height. The students intend to do this experiment at different places and at greater heights. To focus on leading an active lifestyle and do deep breathing exercises every day to increase lung capacity. To avoid exposure to the morning air and during peak hours due to increasing level of smog during winter season.